While not a primary objective of Calcutta Kids, one of the roles we have found ourselves embracing is that of a mentoring organization for the next generation of western development workers. The organization is, in fact, flooded with applications from students seeking internships with Calcutta Kids (from which, unfortunately, we’re able to accept only a limited number.) Maybe this burst of interest is because Calcutta Kids was itself started by a young Westerner with whom young people can identify, perhaps it’s because Calcutta Kids embodies for some, what Nicholas Kristof refers to as the D.I.Y. (Do It Yourself) Foreign-Aid Revolution , or maybe it’s simply because of our clear objectives and proven track record. Whatever the reasons, we have, in taking on interns, been entrusted with an important responsibility, one we take very seriously. 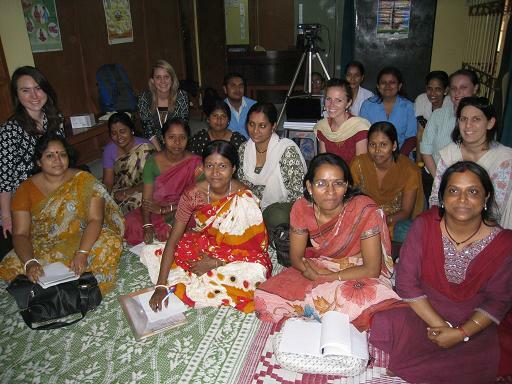 Since Calcutta Kids Trust commenced its work in 2005, we have had the opportunity to work with over 20 undergraduate, graduate, and post graduate student interns from Europe and the United States, most of them having a public health interest or background. These interns usually spend between 2 and 10 months working on a specific project with clear objectives and an achievable if strict timeline. Projects range from illness-specific training and treatment protocol development to project evaluation to website development. The internships to date have been overwhelmingly positive for both the interns and for Calcutta Kids. Apart from the value of their projects – which have invariably been valuable to our on-the-ground operations, these students have often opened their networks to Calcutta Kids for fundraising purposes, an unexpected but much appreciated by-product of the internship. When queried about it, they indicate that having seen the inner workings of the organization at close quarters – having participated in such a range of activities, been privy to managerial deliberations and financial records and having seen first hand the effects CK are having on these disadvantaged families, they believe sincerely that this is an organization they’d now like to support financially. 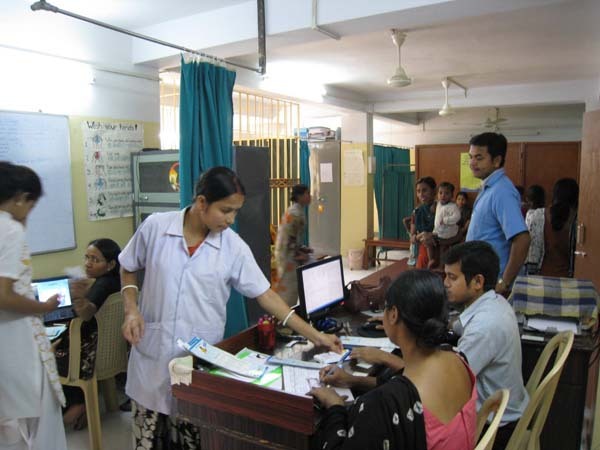 The Swastha Kendra (Health Center) is now open to see patients five days a week. Over the last few months, we have been transitioning the space that was formerly the diarrhea treatment center into a health center that can treat all manner of minor illnesses. While before we had a ‘health camp’ once a week, we now have a fully staffed clinic in order to better serve the needs of Fakir Bagan. The patients are seen by a nurse for basic vitals, then see the female doctor for a full examination and finally receive any necessary medications along with counseling on proper administration and possible side effects of medications as well as beneficial behaviors in the home in relation to the specific illness or complaint. This transition is an effort both to make the clinic space more cost-effective per patient treated, but is also an answer to the needs of the community. In the month of February, 226 clinical visits took place in comparison with an average of 126 visits from July to December. These 100 visits were made possible by the additional hours. Transitioning to this health center approach has also allowed us to start implementing a clinical protocol based on the Integrated Management of Neonatal and Childhood Illness (IMNCI) guidelines. These guidelines are used worldwide for the simple diagnosis and treatment of childhood illnesses with minimal and inexpensive, but effective, medications. Having a full time doctor also allows us to treat more conditions than would be possible simply following IMNCI. It also helps to increase the level of confidence that the patients have in these relatively simple treatments. The diarrhea treatment center is still fully functioning and will be an increasing part of clinical care as diarrhea season approaches. The only change is that diarrhea treatment is now a part of a larger clinic rather than sharing a space with the health camp once per week. Note: We are looking for a sponsor to endow the Swastha Kendra and ensure that these services can continue. For more information about this endowment please write to Noah@calcuttakids.org. Although Calcutta Kids has a very close relationship with the women and children of Fakir Bagan, our efforts in community mobilization have been limited. Community meetings are held for pregnant women and mothers of young children, but these meetings are largely lecture style with information being given by our health workers. 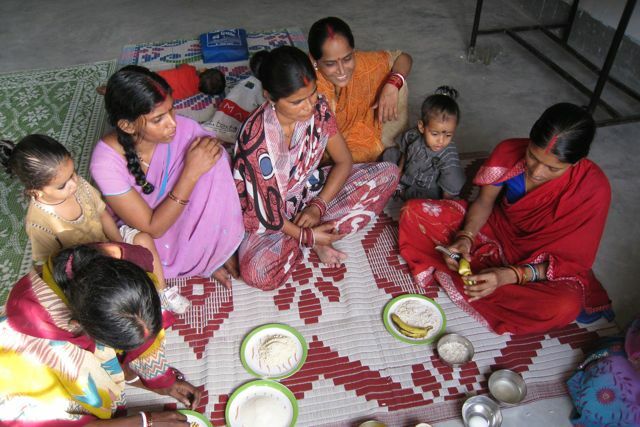 Our goal in organizing a women’s support group was to create a completely different type of forum, where women would come together as friends to support each other and discuss issues that are relevant to them in their daily lives. They would lead the direction of the group and decide what activities they would like to carry out for themselves and within the community. When we started our first women’s support group in mid-November, we had no idea what to expect as we sat on the mat and waited for the women to appear. One by one they came- Rekha, Santi, Sakuntala, Fulo, Rakhi, Priyanka, Sova, and Urmila, their young children in tow. As they sat on the mat, we offered tea and biscuits and asked mothers to introduce themselves to each other. Sumana, the program coordinator, explained about support groups and asked them to think about whether they were interested in forming such a group.